SPOKANE, Washington – The Johnson Scholarship Foundation has pledged $1 million to Gonzaga University’s MBA in American Indian Entrepreneurship program to create an endowment for student scholarships in honor of Diane and Ted Johnson. Gonzaga, in partnership with the Foundation, will raise funds to match the gift thereby ultimately creating a $2 million endowment to support the program. 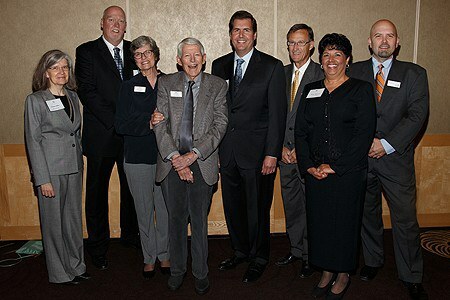 The endowment was announced Sept. 21 at a Seattle event marking Diane’s retirement from the Board and honoring the Johnsons’ years of service to the Foundation. Diane, a former Foundation vice president and Board member, and Ted Johnson, the former Foundation president, have been instrumental in guiding Foundation strategy in support of entrepreneurship and business education within Native American communities. Gonzaga’s School of Business Administration created an MBA in American Indian Entrepreneurship Program (MBA/AIE) in 2001with funding from the Johnson Scholarship Foundation. Since that time, the Foundation has provided full scholarships for qualified Native American students. The impact of the MBA in American Indian Entrepreneurship can be seen firsthand in the opportunities pursued by its alumni. The 50-plus alumni of the program have taken leadership positions large and small in their tribes and communities, leveraging the education and experiences provided by the program to create lasting change. Within their tribal communities, alumni like Richard Janssen (’07) and Monica LeBret (’09) are making a difference in how native communities manage their resources and create new opportunities for growth and economic development. As head of the Department of Natural Resources for the Confederated Salish and Kootenai Tribes, Janssen manages one of the tribe’s most precious resources – the land. In her role as controller for the Kalispell Tribe, LeBret manages the financial needs of a diversified and dynamic set of organizations, initiatives, and community projects. Many MBA/AIE alumni continue their investment in education by building new education and learning opportunities for their people and their communities. Sandra Bercier (’08) serves as interim director of the Native American Training Institute – an organization that provides critical training in child welfare, healthcare, and cultural awareness for all of North Dakota’s tribal communities. Haven Gourneau (’04) began her AIE experience as financial aid director of Fort Peck Community College. This year, Gourneau assumed leadership of that same institution as its president. Spike Bighorn (’05) began the program as a teacher and education director at Fort Peck, and now pursues his mission to create opportunities for native communities on a national level as associate deputy bureau director for Indian Services at the Bureau of Indian Affairs in Washington, D.C. The MBA/AIE program provides graduates with the leadership and entrepreneurial skills to advance Gonzaga’s mission to educate women and men to become leaders for others. Each new cohort begins in the summer with a six-week campus session. The 35-credit, two-year program includes a second summer on campus as well. Housing is provided for students and family members during summer sessions. During fall and spring semesters, students are taught via distance learning and an on-campus weekend. The structure, together with committed faculty and staff, provides convenience, accessibility, one-on-one support and a cohesive cohort model, all of which help ensure participants’ success. The Johnson Scholarship Foundation is active in diverse locations in the United States and Canada and has a mission to assist disadvantaged people to obtain education and employment. The Foundation believes education can empower individuals to improve their economic circumstances and quality of life. JSF invests in a number of programs that support the education and employment of disabled, economically disadvantaged, and American Indian students. For more information, please contact Carroll Deason, director of leadership gifts at Gonzaga, at (509) 313-5983.